I liked liver even as a child and I still do. 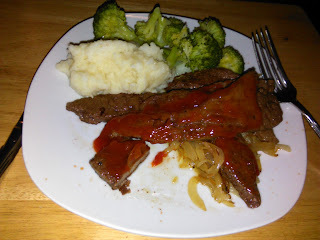 I caramelized a couple of thinly sliced onions first and put them aside while I floured and fried the liver. The mashed had butter, milk and salt and the broccoli was steamed, cooled and reheated in olive oil. As you can see, I dug in before I remembered to take a photo.